Custom Orthotics For Healthy Feet | Podiatry Associates, P.C. Slipping some store-bought insoles into your shoes can give you a little more spring in your step, but what if that step causes you pain? You need more than just cushioning and a tad bit of sole support. Custom orthotics are made to order, not only providing you with the extra cushion you want and support in all the places you need, but also correcting structural and biomechanical issues as well as managing painful conditions. Not all feet are the same or have the same problems, so why use a shoe insert that’s one-size-fits-all? Unlike over-the-counter options that come in standard sizes, custom orthotic inserts are designed specifically for your feet and for your unique needs. Measurements of your feet are taken via a highly accurate, state-of-the-art 3D computer scan. This is sent, along with your custom prescription, to our own, local orthotic lab where our certified podiatrist creates your made-to-order orthotics on a CAD/CAM workstation. Any modifications to accommodate specific issues are incorporated into the design, and after your orthotics are cut but before the top cover is applied, any necessary padding is added. That way, when you slip them into your shoes, they do exactly what’s needed to correct your individual problems and relieve pain! The type of these devices, and the materials they are made of, vary depending upon what exactly you need them to do. There are several different types of custom orthotics, including heel cups and ankle braces, but the two main types are functional and accommodative. Functional are typically semi-rigid as they are used to correct faulty foot function and must keep your foot in proper position and help normalize its movements. These are often used by athletes and others with flat feet or high arches that cause with pronation problems – feet that roll too far inward or outward with each step. They can also help with plantar fasciitis, tendinitis, bursitis, shin splints, heel and arch pain, and other problems associated with improper alignment and abnormal gait. Accommodative orthotics are softer and more flexible since they are used to redistribute weight and provide cushioning to take pressure away from problem areas. This type is used to manage conditions like painful calluses, neuromas, and deformities such as bunions and hammertoes. The fact is, there are many conditions that can benefit from this conservative treatment option, and there are custom orthotics for all types of shoes, too – from athletic to dressy. So, if your heel is hurting, your foot strike is faulty, or your walking is wobbly, there’s a good chance that a custom-made pair of orthotics can help, no matter what kind of footwear you have on your feet! 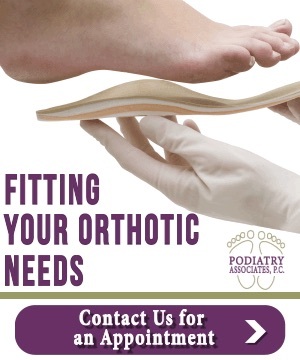 To find out if custom orthotics can help you, call for an appointment by dialing (303) 805-5156. We will assess your feet, your gait, and your symptoms, keeping in mind your lifestyle and activities, which will help us to determine what’s best for you. While custom orthotic inseerts may cost more than over-the-counter insoles, we believe they will prove to be much more valuable – not only because they alleviate discomfort and help you to avoid injury, but also because they last longer and help your feet stay healthy and safe! So, you not only have a spring in your step, but you step correctly and without pain! Call us today for more information.